In this defect, the valve and/or outflow tract from the right ventricle into the pulmonary artery is obstructed. Valvular pulmonary stenosis means that the leaflets, or "flaps," of the pulmonary valve are abnormal. They are often thickened and do not open fully, causing a narrowing where the blood crosses the valve from the right ventricle into the pulmonary artery. 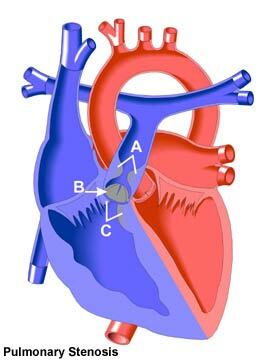 In addition to not opening fully, the valve leaflets may not close properly and leak, allowing some blood to flow back into the right ventricle. In other cases, the pulmonary artery above the valve opening may be narrowed (supravalvar stenosis), or the part of the right ventricle that leads into the pulmonary valve may be narrow or obstructed by excess tissue (subvalvar, or infundibular, stenosis). This is one of the more common congenital heart defects and occurs equally among boys and girls.